Google’s Hindi transliteration keyboard for Android, Just WOW! How many of smartphone users out there have managed to write hindi words on your Android smartphones? Very few that too using some workarounds. But Google’s launch of Hindi keyboard as well English to Hindi transliteration keyboard has made it extremely easy for anyone to type text in Hindi language. Check out the screenshots that I took a few minutes back while typing on my Nexus 4 Android phone. “Google Hindi Input” app allows users to have a full hindi keyboard where users can use to type hindi text. But, the real highlight of the app is its transliteration feature, where users can actually type the Hindi word in English and the app will transliterate it into a Hindi word. So, the beauty is that you can use the same keyboard to type hindi as well as English (see the screenshot above). One thing that you should first know of – Hindi typing will only work if the app already includes support for Devanagari characters. 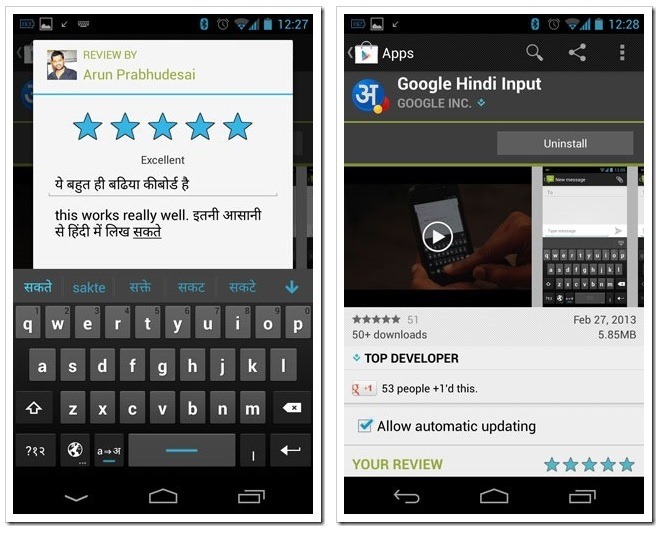 The Google Hindi Input app is compatible with any Android smartphone or tablet running on Android 2.2 (Froyo) or above. Toggle the button “a->?” on English keyboard to turn on/off transliteration mode. For example, type “hindi” and then you will get the word ????? from a list. If you want to return to normal English typing turn off the transliteration mode on English keyboard. Note: I found one small negative aspect about installing this app, the swipe to type feature which is by default available in Android Jelly Bean gets disabled. I love typing using swipe, and I may end up uninstalling Hindi input app for that purpose. Cricket Streaming on Office Bandwidth – Companies turning a blind eye. I am unable to use this transliteration feature. I can see devnagari keyboard but I am unable to type in Roman script and convert it in Hindi.